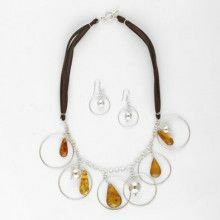 This set features a one of a kind gradient Amber necklace made of highly polished olive shape cut butterscotch amber with beautiful veins of natural variations in color and opacity. 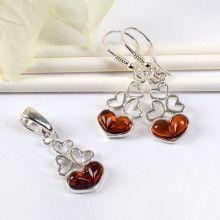 Barrel closure hidden in Amber beads. 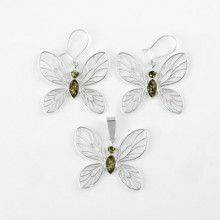 Paired with almost matching Amber drop earrings featuring a highly polished olive shape cut stone accented with a silver disc and two rough-cut, polished Amber beads hanging from hinged clip hooks. Due to the calibration differences between computer monitors & tablets, etc. the color may vary slightly from what you are viewing. Largest stone is 1 5/8" x 1 1/8"